One of the premier human rights law firms in the country – Accountability Counsel – is looking for students and recent graduates interested in international law, human rights, accountability, dispute resolution, complex negotiations, environmental justice, corporate accountability, women’s rights, and/or international development. hold corporate and institutional violators accountable through our dual approaches: direct support to communities and policy advocacy. The organization in particular works on behalf of people and communities harmed by internationally-financed projects through community driven and policy level strategies to access justice. Law Fellow – San Francisco – 2L and 3L law students or recent law school graduates (within one year of graduation). South Asia Law Fellow – Washington, D.C – 2L and 3L law students or recent law school graduates (within one year of graduation). Policy Fellow – Washington, D.C. – law students, graduate students currently studying policy and/or another related field, or recent graduates (within one year of graduation). Data Analyst Fellow – San Francisco – graduate students and recent graduates (within one year of graduation) in a related field of data or statistics. Communications & Operations Intern – San Francisco – undergraduate students or recent graduates (within one year of graduation). Data Intern – San Francisco – undergraduate students or recent graduates (within one year of graduation). Any interested students/recent graduates should consult the website for more information. To apply, students must complete an online application form. The Department of Law at the University of Southern Denmark in Odense is currently advertising a post as Assistant Professor in Public International Law with starting date 1 January 2017 or soon thereafter. The successful applicant will have a strong profile in both research and teaching and also be interested to work in a multidisciplinary environment. This will include contributions to the University’s Centre for War Studies and the interdisciplinary master degree in “International Security and Law”. The candidate is expected to be able to teach in English and Danish within three years from the start of employment. For more information and the application form see the official job advert. Applications are accepted until 21 August 2016. La Revue femmes et droit sollicite des observations rédigées en français sur l’intersection des LGBTQ et des réfugiés. Cette édition spéciale commémore les travaux de la professeure Nicole LaViolette dont le travail a contribué à mieux comprendre les croisements entre l’orientation et l’identité sexuelles et la migration forcée au Canada et à l’échelle internationale. Dans ce numéro spécial, on cherche à faire avancer les travaux de la professeure LaViolette. Les auteurs sont invités à puiser dans une bibliographie annotée que la professeure LaViolette et Mary Kapron ont compilée en vue de générer des idées ou de l’utiliser comme source (http://papers.ssrn.com/sol3/papers.cfm?abstract_id=2457503). Les articles, d’une longueur maximale de 10 000 mots, doivent être finalisés d’ici le 1er octobre 2016. Nous sommes ouverts à la collaboration de nouveaux chercheurs et étudiants des cycles supérieurs. Veuillez faire parvenir des résumés de 500 mots maximum à Jamie Liew (jamie.liew@uottawa.ca) et Mary Kapron (mary.kapron@gmail.com) au plus tard le 1er août 2016. The American Red Cross is pleased to accept applications for the 2016-2017 Clara Barton International Humanitarian Law Legal Fellowship, with our International Humanitarian Law Unit. The American Red Cross International Services Department (ISD) seeks to prevent and alleviate human suffering around the world by responding to disasters, building safer, more resilient communities, and teaching the rules of war. In the coming years the American Red Cross will deepen and expand its programming around the world while also working to strengthen the global Red Cross Red Crescent network, in order to deliver vital help and hope to some of the most vulnerable communities. We are looking for a Clara Barton Legal Fellow to work with the international humanitarian law (IHL) team to support our legal education program on IHL. The fellow will work as part of a small team where he/she will gain hands on experience conducting legal research and writing, providing thorough legal analysis on relevant IHL issues, and working to support and strengthen the team’s IHL education programs. A background in international law or policy, and an interest in social media and educational development are essential. Our fellows work as integral members of our team and carry out professional level work in a supervised atmosphere. Responsibilities include working with the Legal Advisors and the IHL Director, as well as other members of the team to deliver IHL Legal Education programs; research and write short updates for the team’s IHL blog; and compile updates on current IHL issues. Fellows will create promotional materials for use by ARC chapters, partner agencies, and community groups, as well as promoting IHL awareness internally. Fellows will also develop content for IHL-related events, brown bags, and speaking engagements; monitor social media and perform follow-up activities to strengthen our networks; and gather information on IHL programs for monitoring and reporting purposes. Fellows will have an opportunity to work with an IHL Legal Advisor to pursue an independent project related to a timely international humanitarian law issue. Recent law school graduate, with an interest in pursuing a career in international law or policy, international relations, or a related discipline. Prior knowledge of international humanitarian law or international criminal law essential; Must have strong written and verbal communication skills; robust legal research skills, and computer skills, including familiarity with social media tools; Ability to translate complex legal issues into terms understandable by an average member of the public with no prior IHL knowledge; passion for international law issues and humanitarian values; Interest in educational development; Must be responsible, mature, able to work independently, highly organized, detail-oriented, able to handle multiple tasks at the same time and work under deadline pressure; Willingness to do background research and perform general office duties, as required. This position will begin September 1, 2016. To apply, please send a cover letter, CV and writing sample to ihlaw@redcross.org by July 1, 2016. The American Red Cross is an Equal Opportunity/Affirmative Action Employer. For more information about the International Humanitarian Law team’s mission, please see: http://www.redcross.org/humanityinwar. The Max Planck Institute for Comparative Public Law and International Law (Heidelberg) and Universidad de los Andes (Bogotá, Colombia) are looking to hire a Principal Investigator to lead a newly established Max Planck Tandem Group in Transformations of Public Law. Other than research, responsibilities include supervision of two doctoral students at Universidad de Los Andes. There is no mandatory teaching load. The Group will be located in Bogotá, and the Leader will be expected to reside in that city. The initiative will provide funding for at least one extended research stay per year of the Group at the Max Planck Institute for Comparative Public Law and International Law. Additional information may be found here. The deadline for applications is May 15th, 2016. The Human Rights Center at the University of Minnesota Law School is seeking an Executive Director. Deadline to apply is April 1, 2016. The Executive Director will oversee administration and management of the Human Rights Center. Responsibilities include fundraising and development, budget planning and oversight of sponsored projects, monitoring the progress of projects, grant writing, student mentoring, fostering collaborative opportunities; coordinating events and conference, writing and editing reports to funding agencies, supervision, and outreach. This is a full-time, mid-level position that requires a J.D., previous leadership and experience in human rights, international law or related fields. Salary: low 60’s. The Human Rights Center works locally, nationally, and internationally to provide training, educational materials, and assistance to professionals, students, and volunteers working to promote and protect human rights. The Human Rights Center was founded on December 10, 1988, on the occasion of the 40th anniversary of the Universal Declaration of Human Rights. The Center works at the nexus of scholarship and practice in the human rights field, seeking to maximize the effectiveness of human rights advocates. For a full description or to apply, go to http://www1.umn.edu/ohr/employment/index.html and reference job #307634. We’re looking for a couple great administrators. 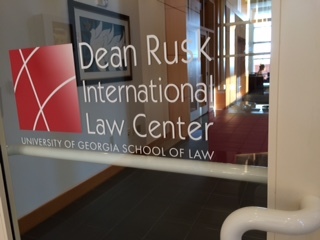 Having just about completed physical renovation of the Dean Rusk International Law Center, an office suite at the University of Georgia School of Law, we’re now focusing on building staff. To be precise, we’re looking for an Executive Administrator (aka Administrative Manager I) and an Administrative Assistant (aka Administrative Specialist I). Together, they’ll be responsible for office management (financial and otherwise), secretarial support for Center staff (including our Director of International Professional Education, our Associate Director for Global Practice Preparation, and our Associate Dean for International Programs & Strategic Initiatives, aka me), and support for an array of Center programs (LLMs, conferences, lectures, and events, study abroad, Global Externships, faculty exchanges, visiting scholars, professional trainings, and research projects). To skim the job notices, see here and here. To apply, click here and follow registration/application instructions, inserting the posting numbers indicated on the prior document(s) in order to reach the precise vacancy of interest to you. We’d like to fill these positions asap, so if you’re interested, don’t delay! The Legal Advisor will work as part of the IHL team where he/she will teach an IHL CLE/professional course; assist with research, writing and analysis on IHL and conflict-related issues; and will support the team in complementing and revising educational materials on IHL to highlight the contemporary relevancy of humanitarian issues. Knowledge of international humanitarian law required and a strong interest in international issues, public international law, human rights and international relations or related fields is essential. This position will report to the Director, International Humanitarian Law. • Perform other job-related duties, as assigned. For more information and to apply, please visit https://www.americanredcross.apply2jobs.com/ProfExt/index.cfm?fuseaction=mExternal.showJob&RID=56011&CurrentPage=1.